The Caminito in La Boca is one of the most colorful areas in the world (think Burano in Venice or Bo-Kaap in Cape Town). The Caminito is high on most visitors lists of things to see, and for good reason! 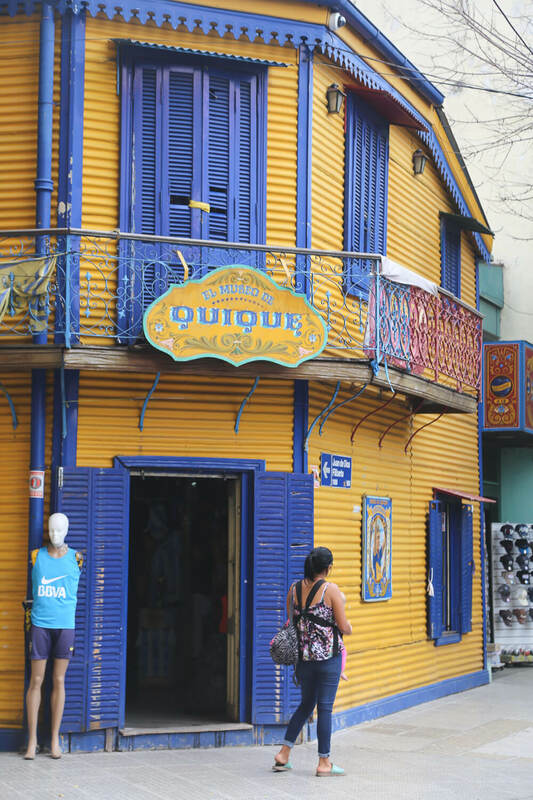 But what should you do in La Boca? There are art museums, great restaurants (hidden amidst tourist traps), and tango in the streets. I'll give you all my personal recommendations below. At the end of this post, you'll find a Google map with all my recommendations plotted out for you. Bienvenido a la República de la Boca! La Boca is located in the south of the city, bordering with San Telmo and Puerto Madero. The name Boca is credited to its location at the mouth of the Riachuelo river, a major port for the city. Ships landed here, bringing colonizers to the region by 1536. However, the major influx of immigrants that came to populate La Boca wasn't until 1830 onward. They mainly came from Genoa, Italy. Coming from a port city themselves, they felt right at home in La Boca. It wasn't long before the Italians were joined by others from Spain, Ireland, England, France, Eastern Europe and other regions of the old continent. Tenement housing was built with pieces of scrap metal and painted with leftover paint from the shipyard. This can be seen today in the traditional Conventillo homes along the Caminito. Tango came to life here. Lunfardo (local Argentine slang) took form from cocoliche, a blend of the Italian dialects and Spanish spoken by immigrants in Argentina and Uruguay at the time. In the 1880's, after a labor conflict that resulted in a lengthy strike, a group of Genovese immigrants decided enough was enough. They signed a declaration to the King of Italy announcing the independent Republic of La Boca. They seceded from Argentina and flew the Genovese flag. While it was shortlived, it was deemed important enough for the current President Julio Argentino Roca to bring the army with him to personally remove the flag. That was the end of that (but the Texan in me is proud of them for trying). The final decades of the 19th century weren't kind to La Boca. The yellow fever outbreak of the 1870's caused the more affluent neighbors to flee to northern suburbs, leaving behind the more destitute. This social divide is still evident today. In 1882 Eduardo Madero presented a plan for a new port, todays Puerto Madero, stealing the strategic role that la Boca had played as the main port. In the 1950's there were multiple efforts to revive the city. Quinquela Martín, a famous Argentine artist famed for his paintings of the neighborhood, led the effort. In 1959, The Caminito was officially given the title of an open-air museum after a tango song of the same name (written by Juan de Dios Filiberto, a friend of Quinquela Martín). EL OBRERO | Agustín R. Caffarena 64 | This is a classic bodegon. The walls and ceilings are covered in futbol paraphernalia and it oozes La Boca pride. You can make a reservation ahead of time or just wait for a table to open up. It's worth it! They have a great Puchero, a local stew with a little of everything (meat, vegetables, beans, the name literally translates to the "stewpot"). I personally love their Tortilla Espanola with red chorizo. EL GRAN PARAISO | This parilla is located just off the Caminito. Eat in the central patio of a traditional Conventillo home, tucked away from the madness of the Caminito itself. The prices are on par with what you'll find elsewhere in the city, no tourist price tag here. The Caminito and the blocks surrounding it are a colorful feast for the eyes. Wander the streets and fill your Instagram with all it has to offer. Enter the traditional Conventillo homes (turned into shops and restaurants today). They were originally single-family homes, but when the wealthy fled the neighborhood's yellow fever outbreak the houses were split amongst multiple families. Entire families would share one room, and the central patios served as communal areas to cook and wash. Listen to the tango music and watch the dancers perform (and remember to tip). A block or two from the Caminito you'll see the imposing blue and yellow stadium, home to the Boca Juniors football team. Legend has it that they selected their colors from a Swedish flag that was flying off a cargo ship in the port. Usina del Arte - Agustín R. Caffarena 1 - Usina del Arte is located in an area the city government is developing into the Arts District. Check the government website for current exhibit and show information. The building itself is impressive in its own right. It's conveniently located across the street from El Obrero (mentioned above), so maybe time your visit to have lunch after. Fundación Proa - Av. Don Pedro de Mendoza 1929 - The Proa is located at the beginning of the Caminito, overlooking the water. The Proa is a contemporary art center with cinema, auditorium and modern art exhibits. The cafe on the terrace is worth a visit for the view alone. El Museo Benito Quinquela Martín - Av. Pedro de Mendoza 1843/35- This museum, facing the water and a statue of its namesake, contains an important collection of the artist. He was famous for his colorful depictions of La Boca. The cobblestones lining the water in front of the museum were actually painted in his honor. The area surrounding Usina del Arte (above) is blanketed in stunning murals. With the city developing the area into the Arts District, they've promoted street art on its streets. The columns of the neighboring highway have even been painted. Explore the streets for some real gems. Walk 2 blocks behind Usina del Arte (behind being behind the museum as seen in the photo above) under the underpass, along Avenida Don Pedro de Mendoza, to find an open-air museum of murals, one right after the other. In general, southern neighborhoods are a little more dangerous, especially after dark. Stay on the tourist paths here and visit during daylight hours. Plan your meals here to be lunches and visit the rest of the neighborhood after. Don't bring everything with you, as in your passport, credit cards, and excess cash, just in case. You'll notice on the map at the end of this post that one museum and one restaurant I recommend are about 8 blocks from the Caminito. I've walked it without any problems, and if you choose to walk the distance, put away your camera and phone and don't draw attention to yourself. Or, just call a taxi or an Uber.